Hennes & Mauritz AB (H&M) is a Swedish multinational clothing-retail company known for its fast-fashion clothing for men, women, teenagers and children. H&M and its associated companies operate in 62 countries with over 4,500 stores and as of 2015 employed around 132,000 people. It is the second-largest global clothing retailer, just behind Spain-based Inditex (parent company of Zara). The company has a significant on-line presence, with on-line shopping available in 33 countries. H&M has not really performed well in the first quarter of 2018 with over 2% fall in revenues and Karl-Johan Persson ,CEO , was forthcoming in accepting the same. 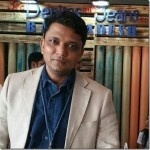 “The rapid transformation of the fashion retail sector continues. As communicated previously, the start of the year has been tough. 2018 is a transitional year for the H&M group, as we accelerate our transformation so that we can take advantage of the opportunities generated by rapid digitalisation. Weak sales in the fourth quarter, partly caused by imbalances in the assortment for the H&M brand, resulted in the need for substantial clearance sales in the first quarter. The high level of clearance sales combined with unusually cold winter weather had a negative impact on the sales of the spring garments. In the first quarter the H&M group’s sales were unchanged in local currencies. Many of our ongoing initiatives are giving good indications and results, even though they have not yet been implemented at a large enough scale to have a decisive effect on the overall results. The weak sales development combined with substantial markdowns had a significant negative impact on results in the first quarter. 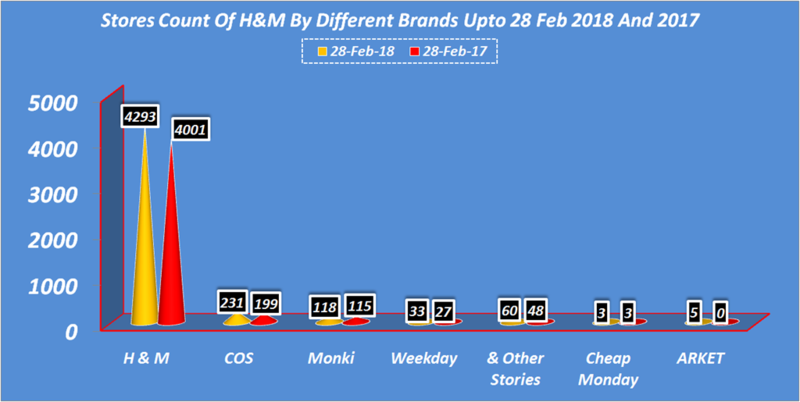 The shares of almost all markets in H&M sales list showed some decline and USA was the highest among them losing over 10% compared to Q1 2017 sales. The table below shows the sales of H&M for different countries for the first quarter of 2017 and 2018, Germany contributes the largest share of about usd 1,010 million for the first quarter of 2017 and with a change of –3% the sales went down to about usd 976 million in first quarter of 2018. The positive change in sales of H&M was seen only in the countries like Spain, Netherlands, Denmark, and Others, where the change was 5%, 2%, 4%, 3%, respectively. The online expansion will continue in 2018 to countries including India, which opened in March, and via franchise partners to Saudi Arabia and the United Arab Emirates in spring/summer 2018. The plan is to offer e-commerce in all store markets as well as in other markets. New H&M store markets in 2018 will be Uruguay and Ukraine, which will open in the second half of the year. For full-year 2018 a net addition of approximately 220 new stores is planned. Most of the new stores in 2018 will be H&M stores, of which 45 will have H&M Home shop-in-shops, while approximately 90 stores will consist of the brands COS, & Other Stories, Monki, Weekday, ARKET and Afound. In 2018, eight standalone H&M Home stores are planned to open. The table below shows its brands are online in many of the countries where H&M has stores. Biggest increase in H&M flagship brand stores happened during first quarter. 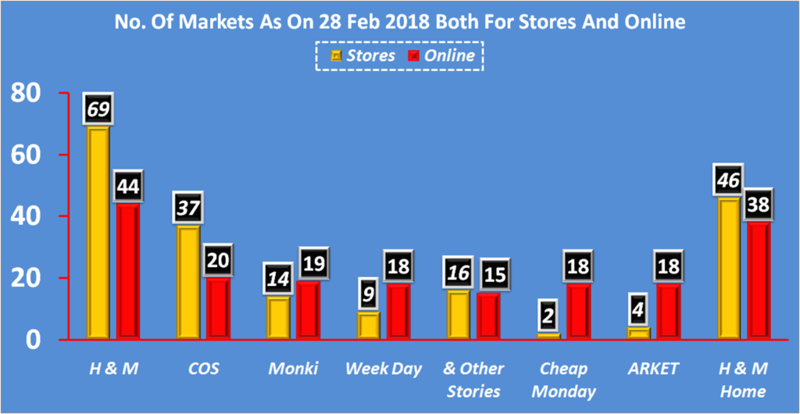 The stores count by region shows that, Europe and Africa regions had a stores count of 2885 stores in 28 feb 2017 and it went upto 2988 stores in 28 feb 2018 , however there was a closure if 20 stores in that region for the first quarter of 2018. 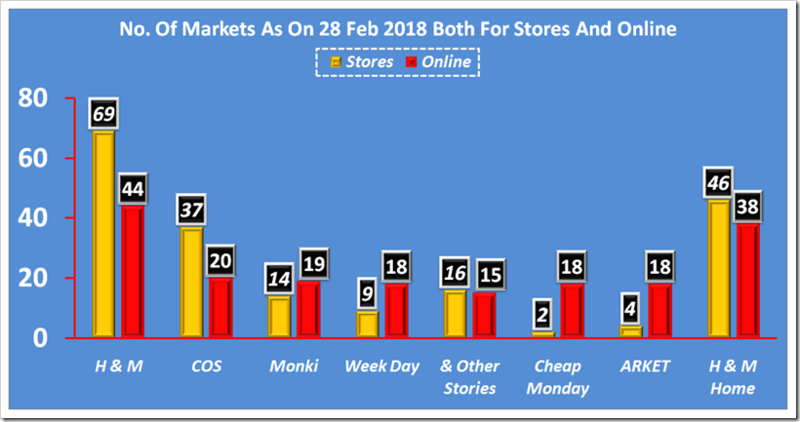 Asia & Oceania had a stores count of 902 as on 28 feb 2017 and which went upto 1062 stores in 28 feb 2018, it is also to be seen that there was 16 stores opened in the Asia & Oceania region . 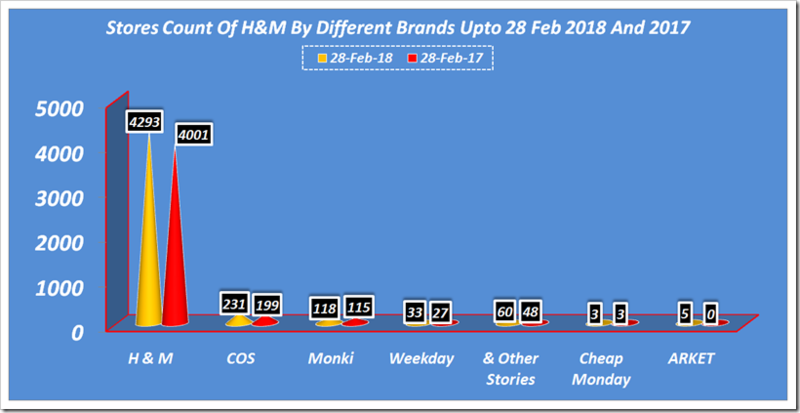 North & South America has a stores count of 606 in 28 feb of 2017 which went upto 693 stores in 28 feb 2018, it also saw an opening of 8 new stores in first quarter of 2018. On the whole, H&M is expanding still but its rate of growth has gone down . It needs to create new ways to take up the digitilization challenge which is chipping away its sales and though it has already done that by opening online stores, it remains to be seen how they perform. Some of the new ones, like in India, have taken off quite well !